Pictura Ioannis Trumbull usitate falso appellata depictio signationis Declarationis. 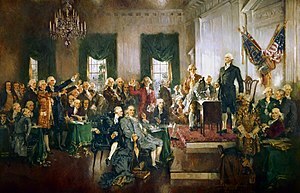 Conditores Civitatum Foederatarum fuerunt duces publici qui Declarationem Libertatis Civitatum Foederatarum signaverunt anno 1776, vel in Rebus Novis Americanis interfuerunt, vel Constitutionem Civitatum Foederatarum annis 1787–1788 composuerunt aut sanxerunt, vel administrationem Civitatum Foederatarum confecerunt. Ricardus B. Morris, insignis rerum gestarum scriptor Americanus, in libro Seven Who Shaped Our Destiny: The Founding Fathers as Revolutionaries (1973), septem homines appellavit gravissimos reipublicae conditores: Beniaminum Franklinium, Georgium Washingtonium, Ioannem Adams, Thomam Jeffersonium, Ioannem Jay, Iacobum Madison, et Alexandrum Hamiltonium. Iacobus Monroe, legatus Congressus Continentalis, quintus Praeses Civitatum Foederatarum, ultimus "Saeculi Republicani"
↑ Nomen attestatum est ("Joannes Hancockius") in Francis Glass, A Life of George Washington, in Latin Prose, ed. J. N. Reynolds (Novi Eboraci: Harper & Brothers, 1835), pagina 48. ↑ 3.0 3.1 Nomen huius familiae attestatum est in Francis Glass, A Life of George Washington, in Latin Prose, ed. J. N. Reynolds (Novi Eboraci: Harper & Brothers, 1835), pp. 146. ↑ Nomen attestatum ("Edmundum Randolphium causarum publicarum procuratorem constituit") in Francis Glass, A Life of George Washington, in Latin Prose, ed. J. N. Reynolds (Novi Eboraci: Harper & Brothers, 1835), pp. 139. ↑ Nomen attestatum ("a Peytonio Randolph") in Francis Glass, A Life of George Washington, in Latin Prose, ed. J. N. Reynolds (Novi Eboraci: Harper & Brothers, 1835), pagina 130. Nomen Randolipius familiae attestatum, pagina 139. Quod accidit Libertatis Declarationis subscriptores? 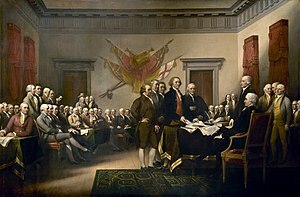 What Happened to the Signers of the Declaration of Independence? Novissima mutatio die 22 Maii 2017 hora 08:14 facta.